The Mardi Gras season goes from Twelfth Night to Ash Wednesday. You go to on Epiphany with Christmas decorations still up in the neighborhood and by morning, everyone (but us it seems) has Mardi Gras decorations exploding from their porches. Today is Pancake Day if you are English, Shrove Tuesday if you are religious, the day before Carnival ends if you are Brazilian, and Fat Tuesday or Mardi Gras if your Louisianian. As we are now living here, we are attempting to embrace all things Louz-yana. We dipped our toes in the water of Mardi Gras by going to the Krewe of Barkus and Meoux parade and Diva tried her first King Cake at school. She even got the baby, but her excitement was short lived when she found out that meant that she had to buy the next King Cake. All I have seen lately in my Facebook feed, on TV commercials, or billboards is King Cake this and King Cake that. "We have them shipped from New Orleans!" "We make the best ones in the world!" "Try our boudin King Cakes!" Yes, that's a real thing and is apparently very popular with the natives. 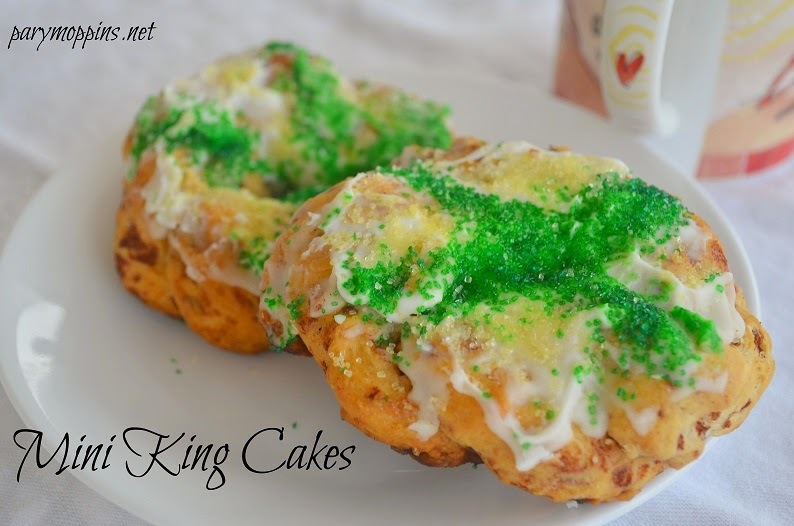 Since there are only three of us and none of us are particularly King Cake fanatics (shhh! don't tell our neighbors) a big cake just seems wasteful. However, when a sweet friend gave us these mini cakes the other day, I thought they were perfectly practical portion control. If you are looking for a fun family-friendly way to celebrate Mardi Gras, you could get your kiddos involved in making these mini cakes. Roll each cinnamon roll into a rope. Pinch two "ropes" together at one end and twist them together. Form the twisted rope into a circle and pinch the ends together so that it looks like a wreath. Lay the wreaths on a greased baking sheet and pop them in a 350F oven for about 23 minutes. Once they are out of the oven, use the cinnamon roll frosting to cover the tops of the cakes then decorate with yellow, green, and purple sugar sprinkles. This is part of FPT and WFMW. I used to live in Louisiana as a child. Mardi Gras is insane there. But there are so many sweet treats! And what is funny, is that just yesterday I was still hearing all about Mardi Gras and today no beat was missed. I've heard nothing but Easter advertisements. I guess they bypass St. Patrick's Day altogether. I am in Texas you you know we are all about Mardi Gras! Thank you for sharing your cake recipe! We lived near a small town in Texas called Jefferson. They have what is call "Mardi Gras Upriver" which seems to draw a huge crowd.